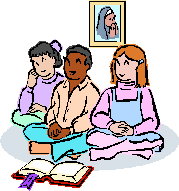 Designed for children in public school grades **K-8, Holy Family’s Parish School of Religion (PSR) is the religious education program offered to parish families. Registration is required and children attend grade level classes from 10:45am-12pm on Sunday mornings throughout the school year. Catechists use a religion textbook as a basis for each week’s lesson. Students learn about our faith and come to know God through classroom textbook activities, prayer experiences, music classes, crafts, plays and retreats. Children in grades 7-8 will have the opportunity to build their relationship with our Lord through "workshops" held several times during the PSR year. **Please note: Kindergarten is also available in our Sunday School program. Holy Family's PSR program also offers both inclusion and individual opportunities for religious education for children with special needs. An adaptive curriculum is especially designed for use with children in our special education classes and with those who are mainstreamed, but still need some additional assistance. Called to Protect, a program which helps children protect themselves against sexual abuse, is part of the religious education curriculum for the Diocese of Cleveland. This program has been in place for many years as part of our PSR program. All children in PSR will participate in this program for three consecutive classes this fall. Catechists have been trained to teach this material and are excited to continue to empower children with the knowledge to help keep themselves safe. A letter will be sent to parents inviting them to attend a session to become familiar with the Called to Protect program and learn ways to protect their children. If you have questions, contact Religious Education Director Diane Hurtuk at hurtuk@holyfamilystow.org or 330-688-6412, x273.